Wearing the home white uniforms this year will be the National team. The complete gameday look will be revealed Wednesday, August 13. Outfielder Ryan Johnson is back for his second Under Armour All-America Game appearance. The left handed hitting Texan is joined by three others from the Lone Star state. The only other state with more than two players is California, with three. All told, the National roster is made up of players from nine US states along with two from the Dominican Republic and one from Canada. 32,Ryan Johnson,OF,L/R,6-3/200,2015,College Station,College Station-TX,Texas Christian Univ. 33,Cole McKay,RHP,S/R,6-5/225,2015,Smithson Valley,Spring Branch-TX,Louisiana State Univ. 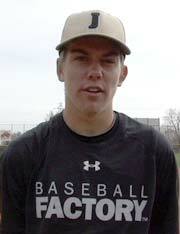 13,Austin Riley,RHP/IF,R/R,6-2/235,2015,DeSoto Central,Hernando-MS,Mississippi State Univ. 9,Corey Zangari,RHP,R/R,6-4/230,2015,Carl Albert,Oklahoma City-OK,Oklahoma State Univ. Beau is an athletic RHP with an extremely quick arm. He generates some of the best velocity in the class, pitching in the 92-96 mph range. He is a competitor who aggressively attacks hitters on the mound with his plus fastball, downer curve and quality change. Add in some deception in the delivery and you get lots of uncomfortable at bats for hitters. He stood out in front of the Baseball Factory scouts at the Under Armour Showcase – Team One Futures Texas. Kody has a high-waisted, athletic build at 6-1 and 175 pounds. He has quick hands to hit along with a good path to contact, and maintains strength through contact, allowing him to generate consistent line drives along with some power to the pull gap with a wood bat. He runs well both in the 60 (6.8 range) and down the line (4.3 from the left side), giving him some profile options. His feet have quickness in the infield, and he has arm strength. In general, he has a good feel for the game, which gives him usable tools – especially hitting ability – but he also has enough feel to play in the middle of the field defensively. His brother Kacy is a former Under Armour All-America Game participant, and his father is 7-time Cy Young winner Roger Clemens. Wyatt is the top defensive catcher in the 2015 class. He has advanced receiving skills and shuts down the opponent’s running game. His quick release and strong, accurate arm have led to times as low as 1.75 to second base – and he’s touched as high as 93 mph on the radar gun. Add in his clean left-handed stroke and durable frame and you have a very appealing backstop. Kyle is a dynamic talent with an impressive array of tools. He swings the bat with authority from the right side showing present power. Defensively, he tracks balls well thanks to his speed and instincts, and he also shows off an arm that plays at all three outfield spots. Starling is very athletic with a well-proportioned muscular build, such that he resembles a slightly smaller framed and less physically mature version of Yasiel Puig. His right-handed stroke produces hard contact from gap-to-gap, with the bat speed for plus power to the pull side. He’s a solid defender with speed to cover a lot of ground and above average arm strength, allowing for profile options in centerfield or right field. Justin is a big, intimidating presence on the mound at 6-foot-7 and 230 pounds. He works from a three quarters angle to generate FB velocity into the mid 90s with excellent arm side life. He spins a tight breaking ball from that slot as well, giving him two advanced offerings. That type of stuff from a long levered left hander makes for very uncomfortable at bats for both right and left handed hitters. Ryan returns to this year’s Under Armour All-America Game after playing in last year’s event as one of two underclassmen. Ryan is one of the top hitters in the 2015 class with a clean left-handed stroke that generates bat speed and power. He has a knack for finding the barrel and can drive the ball to all fields. OF,L/R,6-3/200,2015,College Station,College Station-TX,Texas Christian Univ. Cole has large features and a mature look at 6’5” and 220 pounds. His stuff is that of the prototypical big Texas right-hander, and primarily features a consistent low 90’s fastball with riding arm side life. He’s reached nearer to 95 on numerous occasions, and it seems a safe bet for him to get there more often over time. He’s got some feel for a mid 70’s curve with downward action and change around 80, giving him an arsenal fitting of at least a middle of the rotation profile. RHP,S/R,6-5/225,2015,Smithson Valley,Spring Branch-TX,Louisiana State Univ. Anthony’s long, lean frame produces fastballs that sit in the low 90s with outstanding life. He also has the ability to reach back for more and touch the mid-90s. His curveball has depth and he has a good feel for his change. As one of only two underclassmen in the game this year, and the first underclassmen pitcher we’ve had since Brady Aiken, Anthony is an exciting up and coming talent. An outstanding all-around athlete, Kyle excels on the mound with a repeatable delivery and a low 90s fastball. His delivery is minimal effort and he is a strike thrower. His breaking ball has tight rotation with two-plane break, and a change is his third offering. He has an advanced feel for pitching to go with his top notch three pitch mix. This competitor is one of the top arms in the 2015 class. Ryan is a physical infielder with a knack for finding the barrel against all levels of pitching. His right-handed stroke generates bat speed and pull-side power, and he tends to rise the occasion. As a defender, Ryan has fluid actions, sure hands and a clean release with plenty of arm across the diamond. He’s a versatile defender capable of playing anywhere in the infield, offering a variety of profile options for scouts. Josh is a left-handed hitter with an extremely advanced approach. He finds the barrel consistently and also possesses big raw power. His combination of hitting ability and useable power makes him one of the top offensive players in the class. He has stared for Canada’s Youth National Team the past few seasons. Nick is one of the top hitters in the country. His strong frame produces a well-coordinated swing that leads to consistent hard contact. He can drive balls to all parts of the park and shows the ability to have his raw power play in games in the way of home runs. He has no problem catching up to velocity and his pitch recognition and plate discipline are both advanced. This is a complete hitter who is also capable of using his speed and instincts to patrol center field defensively, though his bat will play anywhere. Nick has proven himself as one of the top 2015 outfield prospects in a class loaded at that position. Cal is a versatile and talented baseball player with relatively young legs as a catcher. Though he appears to have found his home behind the plate, he built his foundation as a baseball player all over the field. His game on the diamond has also been shaped by his time as a standout basketball player. In short, he’s more athletically dynamic than most behind the plate and has the requisite position specific skills. His versatility doesn’t stop with the glove. He is a switch hitter with an impressive combination of physical skill and feel for hitting from both sides of the plate. He is the son of Todd Raleigh, former Head Coach at University of Tennessee and Western Carolina, so there’s no doubt baseball is in his blood. Franklin fits the perfect profile for a right fielder at the next level with his light tower power and plus throwing arm. He generates outstanding bat speed in his aggressive right-haned swing and the ball comes off his bat loudly. His eye/hand coordination and feel for hitting make it likely that his huge raw power will play. He reads balls wells in the outfield and has solid range to go along with his big arm. Franklin’s older brother Franmil, a former Under Armour All-American, is currently playing in the Padres’ organization. Austin is one of the top two-way players in the 2015 class. He has a bright future both on the mound and as a hitter. As a pitcher his fastball sits comfortably in the low 90s, touching higher. He has excellent feel for his breaking ball and competes on the mound. At the plate he has a short, powerful stroke with legitimate power and a feel for the barrel. His big frame and athleticism indicate even more from him in the future. Sati is a big, physical RHP with outstanding stuff. His velocity is in the low 90s from an effortless delivery with an easy arm swing. His three quarters release leads to a heavy sinking fastball. He complements that with a sweeping slider and a change. He has feel for the slider – he showed the ability to add and subtract with it, and consistently threw it for strikes. This is a young pitcher with a durable body and more velocity in the tank. An outstanding mix of tools and instincts, Nicholas can really play the game. He swings the bat with natural rhythm and generates serious bat speed through the zone, making consistent hard contact. As a defender, Nicholas has quick feet, soft hands, a quick release and plenty of arm strength across the diamond. He has present strength and is an excellent athlete helping to make all of his tools usable right now. Nicholas is the son of former Major League player, Terry Shumpert. Corey is a physical right-handed pitcher at 6-4, 220 pounds. Fittingly, he features the classic power arm combination of a mid to upper 90’s heater with a hard, biting breaking ball. He sits in the mid 90’s and has touched as high as 98, while the breaking ball has shown knee-buckling depth. His power isn’t limited to the mound. He handles the bat well enough to be considered by many a top-flight two-way prospect. RHP,R/R,6-4/230,2015,Carl Albert,Oklahoma City-OK,Oklahoma State Univ.